Afghanistan's President Hamid Karzai has urged the international community to reassess how it is fighting the Taleban and their allies. He said he was not surprised that so many people were being killed in southern Afghanistan. Meanwhile, al-Qaeda number two Ayman al-Zawahiri has called on Afghans to fight foreign forces in their country. The BBC's Alastair Leithead in Kabul says Mr Karzai's criticism is a sign of his growing frustration at the worsening security situation in Afghanistan. Without mentioning Pakistan by name, Mr Karzai also made strong references to where the international forces should be turning their attention to cut off the insurgent source of funding, training and ideology, our correspondent adds. Pakistan has been widely blamed for not doing enough to stop insurgents crossing into Afghanistan and even for complicity - something Pakistan denies. The American soldiers were killed after US-led coalition forces attacked "enemy extremists" in the Kamdesh district of Nuristan Province, a coalition statement said. Fighting has intensified in Afghanistan in recent months. Hundreds of suspected Taleban militants have been killed. 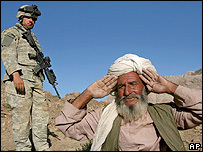 Attacks blamed on the Taleban and their allies, including suicide bombings, have also targeted US and other foreign troops. In a three-minute video that emerged on Thursday, Osama bin Laden's deputy, Ayman al-Zawahiri called on Afghans to stand up against the "infidel forces that are invading Muslim lands". The video was posted on an Islamic website. "Muslim brothers in Afghanistan, and especially in Kabul, stand as one with the mujahideen (Islamic fighters) so that the invading forces might be expelled," he said. Mr Karzai responded by describing the al-Qaeda deputy as an "enemy of the Afghan people" and blamed him for causing Afghans misery over the years. "He killed Afghans for years, thousands, and then he went to America and destroyed the twin towers," he said in comments quoted by the Associated Press. "He is the one who destroyed our mosques and schools, vineyards and orchards." 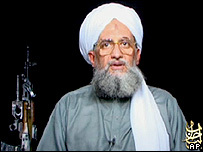 Zawahiri and Bin Laden have evaded capture since US-led forces brought down the Taleban regime in Afghanistan in 2001 following the September 2001 attacks on the US.